The ammonia jar spell on this forum was posted here in 2009 by a member called charminmuse, whose IP address was located in Florida. No one seems to know who she is or where she learned this trick. She has not posted or visited here since 2011. By 2010, about a year after charminmuse posted the ammonia jar spell here, it began to be found on Wicca sites, evidently by people who spread it from here — and since then it has assumed a life of its own and has been found on general spell-casting sites all around the web. Well, for me it is'n working then this time. For sure I will try the spell again within different circumstances en will follow up on the story. I'm really curious now.... Thanks for the answer!! I'm not quite sure if I saw this question answered.. Does an ammonia jar need to be redone if the tape comes apart from the sides of the jar.. I used some double sided scotch tape on a jar.. After I inverted the jar.. the white paper came off the sides.. The statement is still upside down and submerged in the ammonia...However it is not attached the sides anymore.. Should I redo this? Thanks for your responses. Does it matter what kind of ammonia is used? The store I went to didn't have plain ammonia, only lemon scented. I am very new to lucky mojo. However, a several months ago my boyfriend basically told me it was over. So, I was wondering what I could do to get him to at least communicate with me so a few weeks ago I came across this bottle spell. Magically, it worked! Within a week we were in contact with each other and even seen eachother the very next day. The strange part it is it only lasted for a week. Lines were crossed things were did and said that we both can never take back. In 11 years we've never have acted that way towards each other so it was very scary. I am wonder was it the fact that I didn't dispose of the bottle after we started talking. Any ideas. I know I'm a few years late with this topic but if someone knows can they please share. I think it speaks to the fact that magic can't do ALL the work for you - you are still responsible for doing the mundane stuff that supports your goals. You obviously had some deep seated issues in that relationship that had not been dealt with. When you drew back together, those issues still remained, and they caused more problems. This is one of the biggest challenges of Return to Me and Reconciliation conjurework - the individual issues each party has, as well as the issues you had a couple HAVE to be dealt with in one way or another (counselling, or personal work, or however you choose to resolve it), or they'll simply crop up and cause all the same problems as before. Thank you for your response. I appreciate it! Although we haven't talked since our last falling out but your right. I should've address those issues instead of trying to sweep the problems under the rug and act as though they are not there but I will know what to do next time. What say ye, wise ones? Overthinking...but actually you are thinking... put that focus in your intent. Why does this not make sense to me? Am I suppose to tape it to the top covering the whole opening of the bottel? That wouldn't work right because then the paper would be upside down to begin with.. right? or my writing would be facing up and not looking down into the jar.. So that would mean if I looked down at the jar before putting the lid on a turning it around I would or wouldn't see the writing? Or do I just tape it to the side by the mouth of teh jar? <--is that right? Do I tape the Paper? Will the words be looking out or towards in the jar? I tapped mine with words looking into the jar, right side up and then when it was flipped it was upside down. Hmm I am just an amateur here but maybe it was the wording maybe something like " I want to gain 10 pounds." since the the turn around from gain is lose. Not sure though. I just did an ammonia jar but knocked the jar by accident and some of ammonia came out. I guess lid wasn't on tight enough. I sealed the jar and spoke my situation strongly. I was wondering if I should redo it or just leave it? Hi everyone I have a question about this spell, can I use this one a man that does not talk to me? I understand that I suppose to write the situation as it is now like ...does not talk to me & ignores me but after i close it & turn it upside down do I repeat what i wrote in the jar or what I what to happen? With this spell. My boyfriend and I are having problems. He keep saying he loves me but makes excuses that we need a break. and his actions seem like he doesnt love me. Now today we got into a huge arguement and now he isnt talking to me at all. For my petition do I write "_________and I are not together" or "___________acts like he doesnt love me" or "_______ and I are no longer in a relationship with each other"
[quote="catherineyronwode"]The ammonia jar spell on this forum was posted here in 2009 by a member called charminmuse, whose IP address was located in Florida. No one seems to know who she is or where she learned this trick. She has not posted or visited here since 2011. Do you need any protection while doing Ammonia jar spell? Lizzza: I would get a reading or do a divination to see if any complications arose from the spilling of your jar! Or do i state what i want to happen example" john will call me"
Thank you for your help with this spell. I'm wondering if I should dispose of the jars I've made (all for the same situation) and start the spell again since I did see big results with the spell, but they only lasted one day. Should I leave them and see if the results show again, or should I consider it as worked and do again? Also, I've added to it a freezer jar spell, there's no reason why they would counteract, right? The freezer spell should freeze a situation out of my life, not freeze it all together... Right? what do i do with the petition paper? Is it ok to tear the paper in peaces and throw htem aong with the amonia at crossroads, and then recycle the jar? I did this amonia jar about a month and a half ago. I stated on my petition, that I didn't have a decent running car, and that I didn't have a car at all. I poured amonia in the jar and turned it upside down. This month I found out about back pay child support that was owed to me from building up, the funny thing about it was, I checked this card when they sent me a check for $45.00 last year. The automated system said I had a 0 balance. I tore the card up because to my knowledge he was caught up. I was using my sisters address, I moved and was never notified that money was building in my account. When I was told I had over 2,000 I almost dropped the phone. I have enough extra saved to purchase a decent running car. I've tried this but the opposite way, I wrote what I wanted instead not the current situation. I dumped out the contents in running water, washed the jar and blessed it in the name of the Father, son and holy spirit before doing it again right now, only I didn't tape the paper though I measured so its floating around in the jar. Do I start from scratch again? I would start from scratch again, making sure to write down the situation you WANT to change and following the directions to tape it inside of the jar. I think that if you're going to do this spell, you should do it as written. Followed the instructions but again, thee tape disolved andd the paper is justt floating in the baby jar. Before that, when I flipped it the amonia leaked so I tried again. Do I start over again? on top of everything theres this gal tring to but in to my currant marrage after we helped them with a place to stay so what products do you recemend i get i'm on a budget and usaly make my own but i feel the exstra energy from you cat and lmj will give me a exstra boost i need. thank you and blessed be to all. Well everyone, i got my car that I was saving up for shortly after I did this spell. The spell is still going because I never got rid of my jar with the amonia in it. My car had a leak in the timing cover chain dealing with the motor! It was serious and roughly $350.00 the guy that sold me the car paid for the repairs!!!!! OMG!!! WOW this spell keeps working i wrote a list of what i needed to turn around and numbered them 1-? and then put it in the jar and in order they are turning around thanks everyone (sorry for the terrible spelling not getting much sleep the baby dosnt sleep all night yet lol)she is cute any who i cant wait till i get my oils to help my jars along.they can't do all the work if it was that ez everyone would do it .you have to meet magic halfway.and beleave in your work and never dought yur self.if u want it you have to let ur self have it. thanks cat and staff and all who nurture and gide all hearts that come to you for help. I literally stumbled across this site and very surprised about this world of possibility. I am very interested in trying this spell however with my situation I am not clear on the type of wording I should use. My situation: I am going through a divorce, my ex husband conned me into signing over my house (which my father bought) to a woman in order to get a loan. He was in a relationship with this woman all along. Now I am trying to get the house back in my father's name through an attorney. So far the attorney hasn't been doing anything for months and there might be a possibility of me getting in trouble in all this. So my intentions are to get back the house in my father's name and sell it and not have my lying ex or this woman benefit from this house. I do not know how to word this, any advice/help would be greatly appreciated. I did three and one worked in about a week and a half. The other two are still out there, but they are tougher jobs and are about reversing the way someone is acting/treating me and others. The one that worked was about a "situation". I am doing one more about a "situation" and expect great results. Anyway, I just poured out the jar and washed it. I am curious, if you were going to "pay" a spirit for this, how would you do it? No spirit was specifically called for this. So, would a general thanks do? I really like the way this spell is set up. 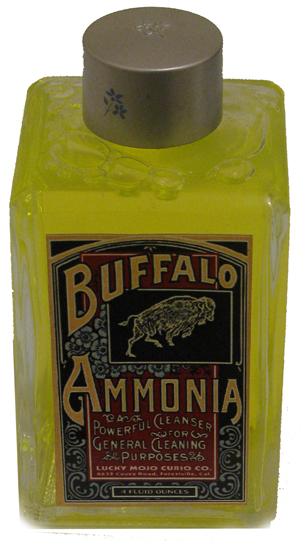 I'm currently experimenting with the different properties and uses of Ammonia. What kinds of herbs could be used to madge the spell stronger, if herbs can be added at all. I was thinking about Vervain because I've had great success using it to turn things around to work in my favor. My only concern is the effect the Ammonia would have on the herbs. Any thoughts? It's been 2 weeks yesterday since I did the ammonia jar. I noticed that the strip of paper has come off and floating somewhat on the inside of the jar. Should I just dispose and start over or could I use the same jars again? There is any problem if I'll use ammonia with lemon scent? The person who originally posted this spell never did reply to people who asked about what to do if the tape comes off. The person who originally posted this spell did not specify unscented or Lemon-scented, but personally, i would work with Lemon-scented, as it is more pleasant (if Ammonia can ever be said to be "pleasant" in scent!). Can this spell make a nasty person see the error of their ways and apologize? I hired this lady to work on my team who has severely criticized me and my style and wanted to instruct me on how things should be done. She caused many problems on my team. She has been downright nasty to me. I was able to make a switch on the team and a colleague of mine wanted her on her team so I made an employee change. Unfortunately, the situation has not ended as she still continues to engage my team, and had a meeting with my boss where she criticized me I got reprimanded. This is the last straw. She has no gratitude and I work very hard to have her criticize my every move and my reputation. I was thinking of doing an ammonia jar spell but as this is my first time, I want to get it right. I will write the current situation as it is today on parchment paper to ensure that the paper goes around the jar and fill it with ammonia so that it covers the inside of the jar and turn the jar upside down and let it soak. I do not have lemon ammonia but can get it if need be. Can I write how I want the situation to be? Thanks for clarification. I read all the posts but I don't think this is clearly explained. Thank you again. I am thinking of doing this for a relationship problem. I want to get back with someone who I know still likes me, but he has commitment issues. Can an ammonia jar be used to solve this? Also, for the petition paper, do you just write your intent down or do I write down our names and d.o.b, too? And is the petition paper and liquid ammonia the only things needed in the jar? Perhaps combine the ammonia-turn-around spell with a bit of reconciliation work. ]Also, for the petition paper, do you just write your intent down or do I write down our names and d.o.b, too? And is the petition paper and liquid ammonia the only things needed in the jar? [/quote] Work your names & DOBs into the petition. "May John Doe (1/1/1957) turn himself around and come back to me Jane Smith (2/14/1971) and be fully committed etc". Yes, it is only the petition paper and the ammonia in the ammonia jar. Question, I thought you are supposed to write the situation as it is now, not your intent. I see what you're saying about wanting the present situation to go away. But, it is preferable to petition the intent. That way, you have more control over the situation. I noticed this question being asked before, but I don't think it was answered. Can you use double sided tape to stick the paper to the jar? I thought it'd be better to keep the paper secure, because it's less likely to peel off than normal tape, when the ammonia is added. I am getting household ammonia today, so hopefully this will work for me. Doing one to remove the blocks in my relationship and another for problems getting a job. Doing each in seperate jars, since it's been recommended not to do more than one intent per jar, unless they're related. I'm sorry but I don't quite understand what it is that you want to do. Could you be a little more specific, please? I was wondering if I can use double sided tape to stick my paper with my situation on it to the jar, instead of scotch tape, because I think it may be more secure and less likely to peel off. Or does it have to be normal tape? I'm also having a hard time finding ammonia in local stores. I'm from the UK, you see, so it's not sold as commonly here as it is in the US. Is there anything I could use in place of ammonia or does it have to be ammonia? Just a little suggestion, I set up an ammonia bottle but I used a small botte that had a cork top. The fit was perfect no spills no mess. I found the bottle at Hobby Lobby, Michaels has a get glass section too, for all you hoodoo practitioners. I have a lot of spells to set up so I documented them in my journal and numbered the bottles so I could keep track of the petitions. As the spells work you can dispose of them in the proper manner. But remember some situations take a lot of time. Just a FYI, I had court case work done on my behalf by "Khi" we went to court for a custody case and I thought that all was lost!!!! Because the judge did not return my daughter to me. That same day while we were in court downstairs, a woman whom my re-married ex was having an affair with, filed a protection order against him in the same court house!! We are going back to court with new evidence. He doesn't look soo good now!! Never lose faith in bottle spells!!! I put a petition in a vinegar bottle and tossed it into the Potomac River in DC. It took me 3 months to find out all our work was not in vain!!! I'll keep you guys posted on my ammonia spells. About the tape: I'm just concerned that if it's double-sided, it might attract things to it (if it's sticky) that it shouldn't. That would be my concern. I don't know exactly what you trying to do with the ammonia jar spell so this might be a little tough to answer. What is it that you want to do? Maybe we can suggest a different spell for you if you don't have ammonia. Well, I had planned to do two jars. One to remove blocks in my relationship. I am currently working on a honey jar, but in order to let it work to the best it can, I need to remove two blocks. His selfishness and lack of commitment. The second jar was for helping with whatever is stopping me getting a job. I have been trying for months and months to get a job and the countless places I've applied for, not one has called me in for an interview. So I was hoping to turn that around with an ammonia jar. So, you have a lot of blockages. I'm sorry about that. While I am doing this for the 13 days, I am also cleansing the house with Chinese wash, lightning candles, and incense. After the cleansing ritual, then I work on whatever spell that I want to bring in. But, in your case, I would also think about a Road Opening spell also. Hope this helps. Wishing you the very best and praying that these blockages are removed. I have used both regular tape and double sided tape to keep petitions in place on the outside of some works. I do see the reasoning behind Miss Aida's advice, but as long as you use the double sided tape properly nothing will be able to be attached to it except for your petition/photo and the glass it's taped on. I wanted to thank every one on this site I did an ammonia jar, I stated the situation as is was, in about a month in 1/2 my situation reversed it self. Which is great. I will de doing more jar to reversed other matter in my life, my question is after you do ammonia jars do you cleanse your home and yourself. sexyboriqua70: Cleansing the self and the home is never a bad idea, especially after some work. If you feel like it is time, or it feels necessary to you, then go ahead and get cleansing. sexyboriqua70: You got it! Glad to offer some positive opinion on your situation. Cleanse it up and you will be good to go! Best of luck to you. Hi All, How Can I Use This On My Enemy!? Thanks! San_Miguel, there are five pages of information on this question. Please read through this thread and you will find what you seek.